We have previously noted that a surface or grid can be thought of as a single valued function z=f(x,y). Mathematical models of surfaces typically assume that the function f(x,y) has certain distinctive properties: (i) single valued — i.e. there is only one z value for each (x,y) pair; (ii) continuous — in broad terms this means that a value exists for every (x,y) pair; and (iii) twice differentiable — first and second differentials can be computed at (almost) all locations. The mathematical surface model is then a single function or a piecewise function that satisfies these requirements. Piecewise functions are continuous functions over some interval or region (e.g. a 3x3 grid of cells) but which have breaklines at the edges of the region. Piecewise continuous functions are widely used in surface modeling and interpolation, where particular conditions are set on behavior of the function at the edges (for example that the gradient matches that of the adjacent regions). 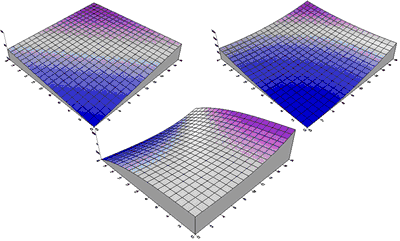 Single function mathematical models are typically used to approximate real-world surfaces, often using least squares methods to provide best fit parameter estimation. As such they are described as approximating or non-exact models. Piecewise models are typically exact, but inexact or smoothing variants of such models are also provided within some software packages. In most cases models used are algebraic functions with powers limited to linear, quadratic or cubic expressions in x and y. Example surfaces of orders 1-3 are shown in Figure 6‑6 — each of these examples was generated as a grid using the Surfer Grid menu, Functions option. Some software tools talk about quadric or quartic functions (i.e. in 4th powers), but these are typically limited to terms of power 2 in x and y, i.e. expressions like ax2y2. Quintic functions (i.e. in 5th powers) are also used occasionally, for example TNTMips provides the option for quintic polynomial fit to individual triangles in a TIN network (deriving the parameters from the triangle itself and its immediate neighbors). This is then used in interpolation within the selected triangles. Quintic functions, with all 21 parameters, are the minimum degree of polynomials needed to ensure zero, first and second-order continuity across triangle edges. In principle, mathematical models, which are scale-independent compact representations of surfaces, could be used in place of alternative vector and grid models. At present this idea, which has been described as Map Calculus by Haklay (2004, 2006), has not been implemented in commercial GIS packages. Haklay provides a simple demonstration of this approach using Manifold, and it is possible that such models will be incorporated into GIS packages in the future.